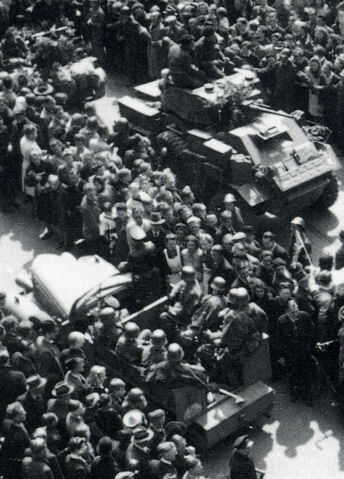 Case Classification: Senseless shooting into cheering civilian crowd by German Navy personnel, two days after Nazi's signed treaty to surrender to The Netherlands. 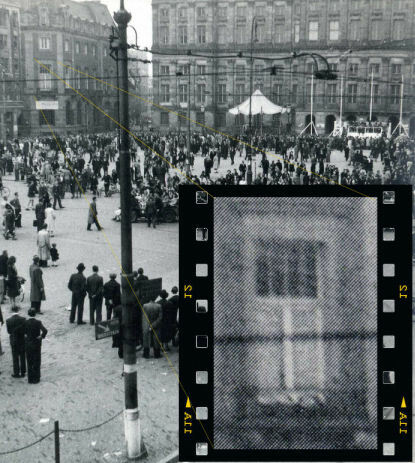 This investigation was initiated after close analysis of numerous photographs and film footage of the shooting incident on Dam Square in Amsterdam, two days after the Germans had surrendered. 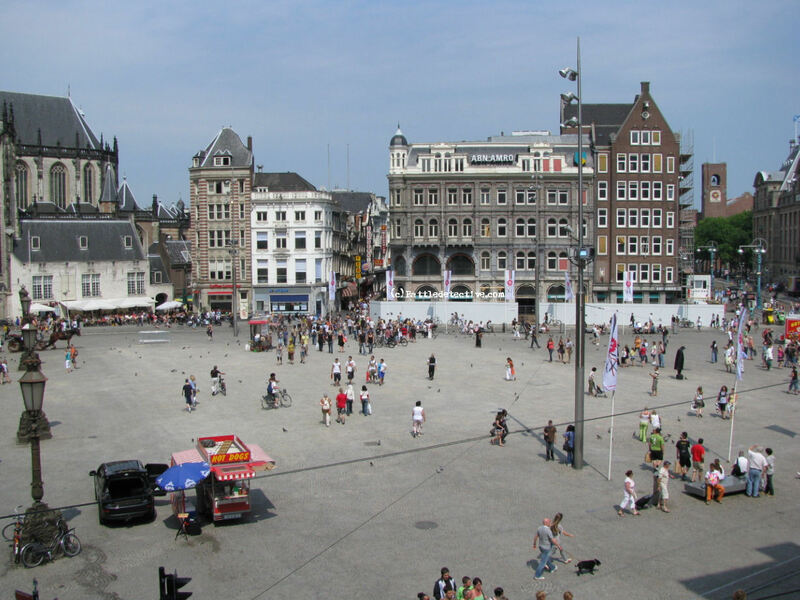 Close study of the available images revealed that there hardly exist any pictures of the soldiers who started shooting rifles and machine guns into a crowd that had gathered on Dam Square. 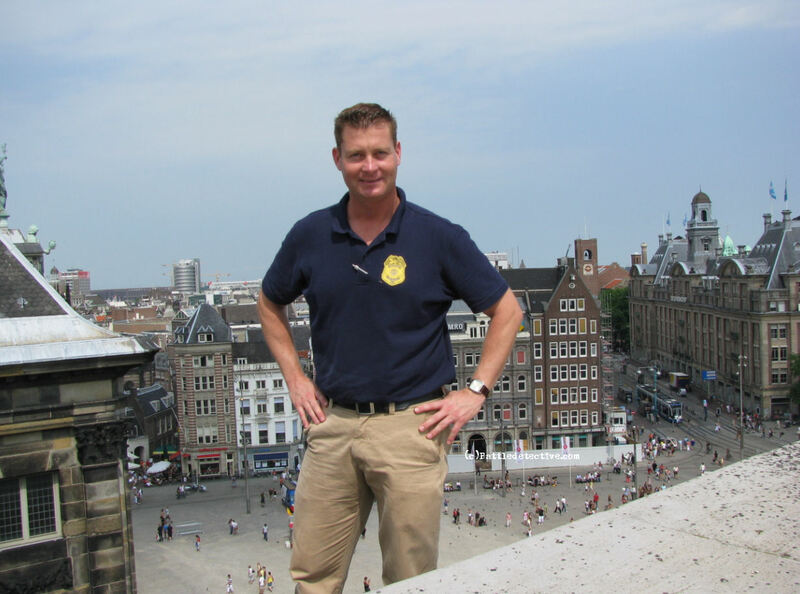 This Battle Study sheds light on details of the actual shooting and what had started it. Meanwhile armed member of the BS start disarming stray German soldiers. 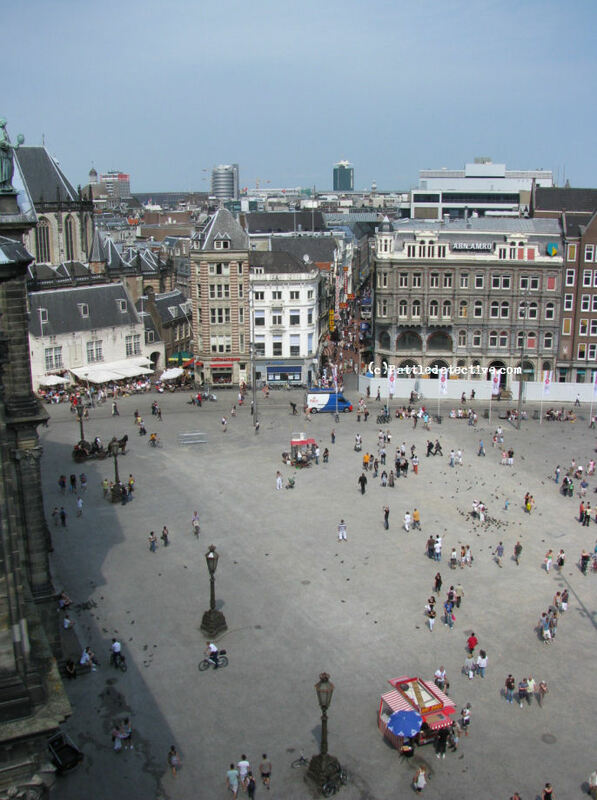 Then, at about three o'clock a single shot sounds form the direction of the Royal Palace, followed by automatic gun fire. Panic breaks out. 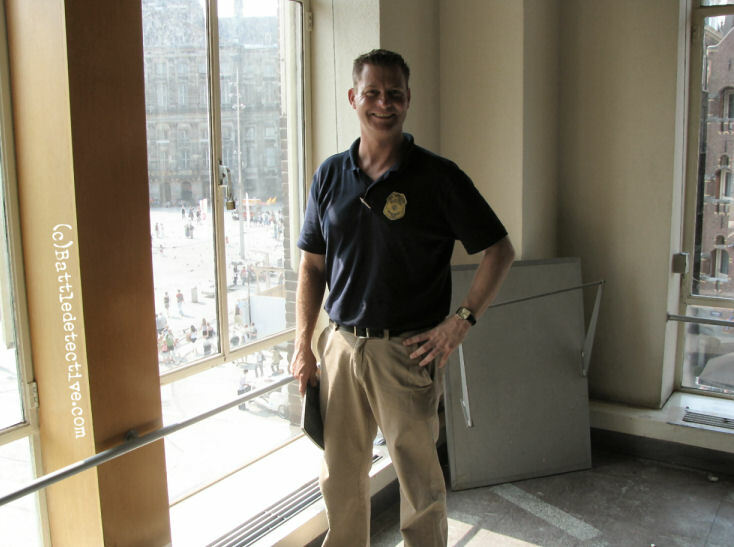 It is often said that the disarmament of a German soldier by member of the BS resistance group on the corner of Spui Straat and Paleis Straat, led to the shooting incident. For two reasons, however, it is doubtful if this is really what caused the shooting. under the crowd's hilarity. These women were tried before some kind of tribunal. The heads were shaven and painted with lead vermillion. All this did not happen quite gently. Blood poured over their faces. 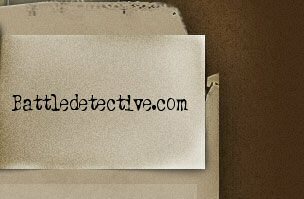 The women screamed and cried for help. This all happened under the eyes of the Germans. The Germans shouted to leave the women alone, this, however did not happen. Meanwhile BS-ers circled the Palace. Some of them stood at the organ with loaded rifles or something like that. of whom some (their number is unknown) later passed away." 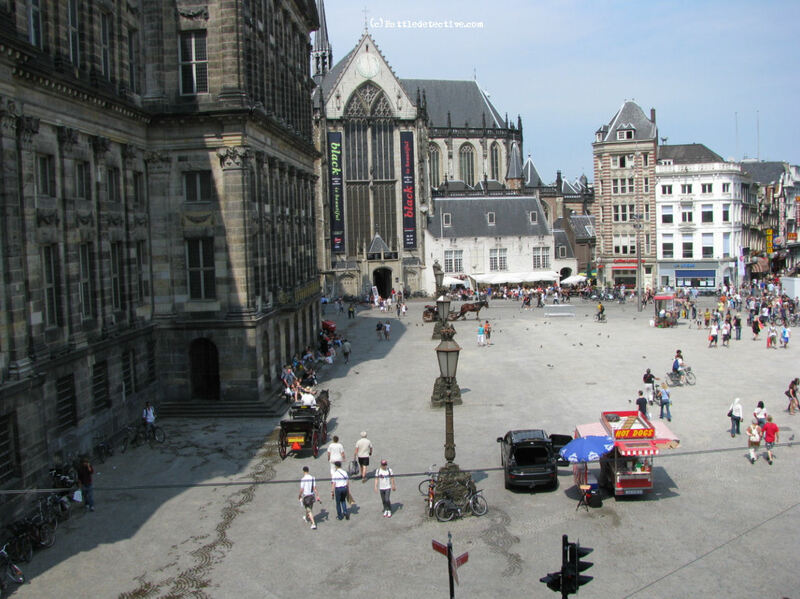 Unless the Kriegsmarine men leaned out of the windows of the Groote Club, they could not see what was going on at the corner of Spui Straat and Paleis Straat. 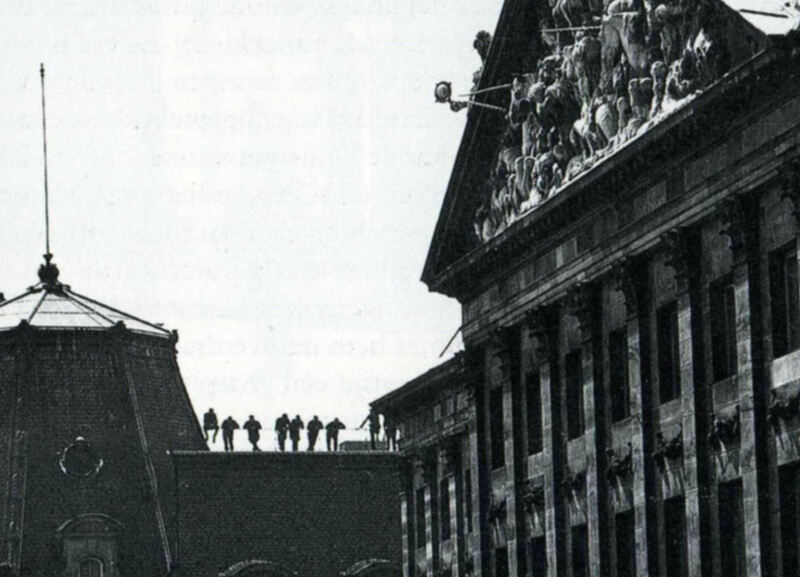 Photographic evidence shows that prior to the shooting, personnel of the German Kriegsmarine was seen on the rooftop and behind the windows of the balcony of the Groote Club. 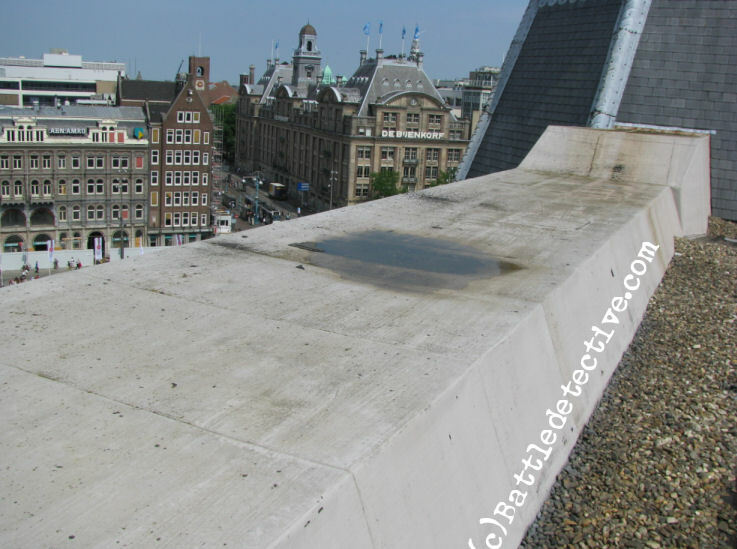 top of, a guard rail on the rooftop. This photograph was taken by Wiel van der Randen and is copyrighted by the Spaarnestad Photo Archive of Haarlem, The Netherlands. 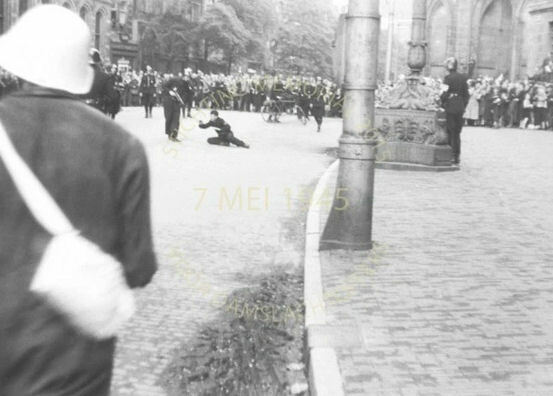 We have recently discovered two photos taken on Dam on may 7 1945 of of Dutch Forces of the Interior (BS in Dutch) disarming German military. 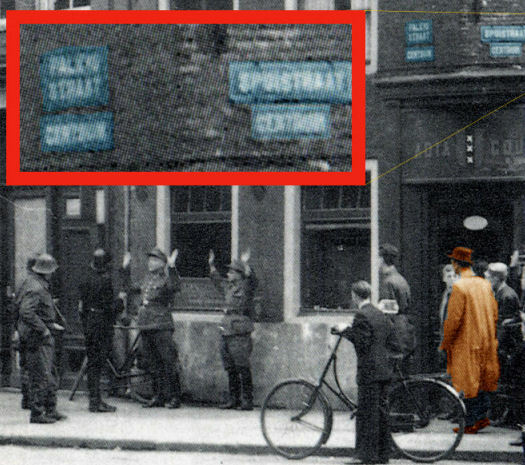 One image, in full color, shows two men in civilian cloths with their hands up, herded forward by a Sten gun toting Dutch BS-man. 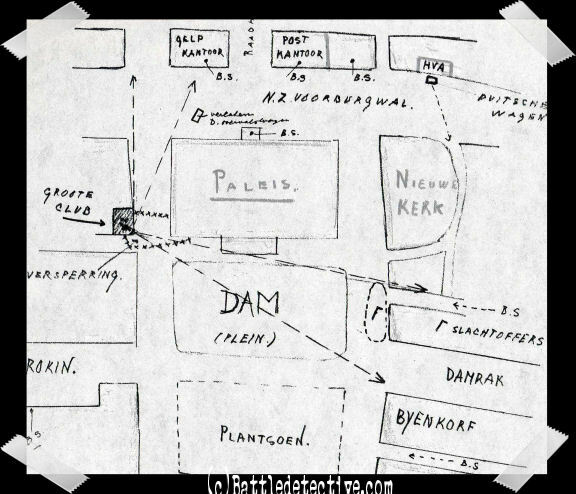 These scenes are likely to have irritated the Kriegsmarine men in De Groote Club, causing them to intervene by opening fire on the BS-men and the crowd. 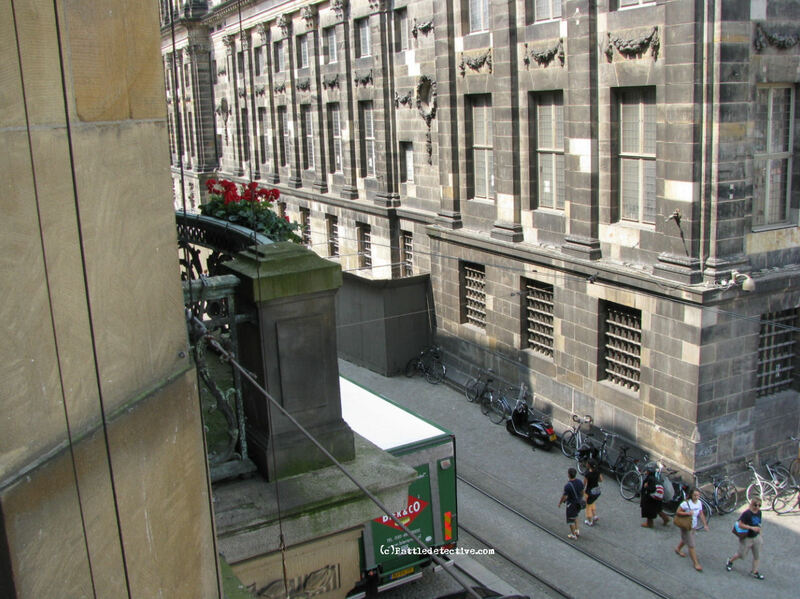 Various photographs show the balcony and the window behind it. 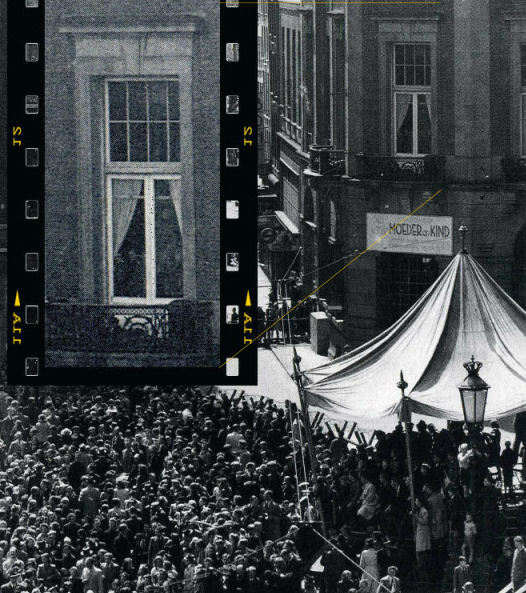 A short while later, when the crowd got bigger, the curtains were moved and figures, looking through windows in the doors behind the balcony are visible. The barbed-wire road blocks in front of the entrance under the balcony can be seen. 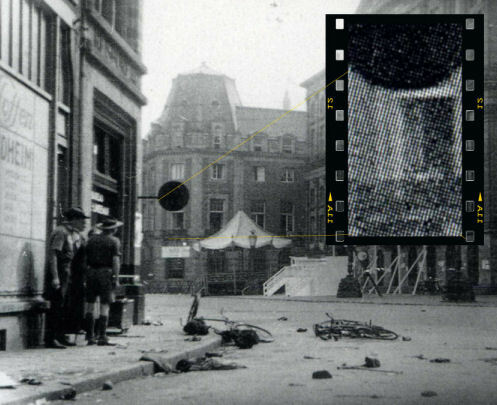 The next photograph was taken during, or shortly after, the shooting. 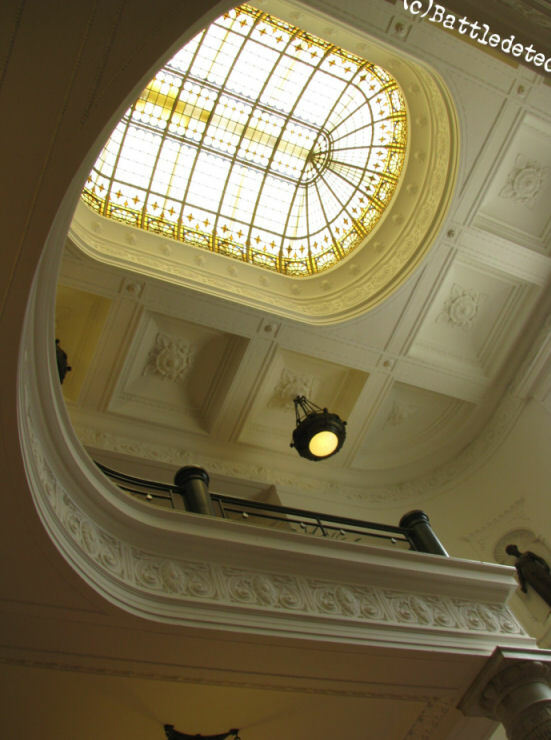 The doors, leading to the balcony, are opened. 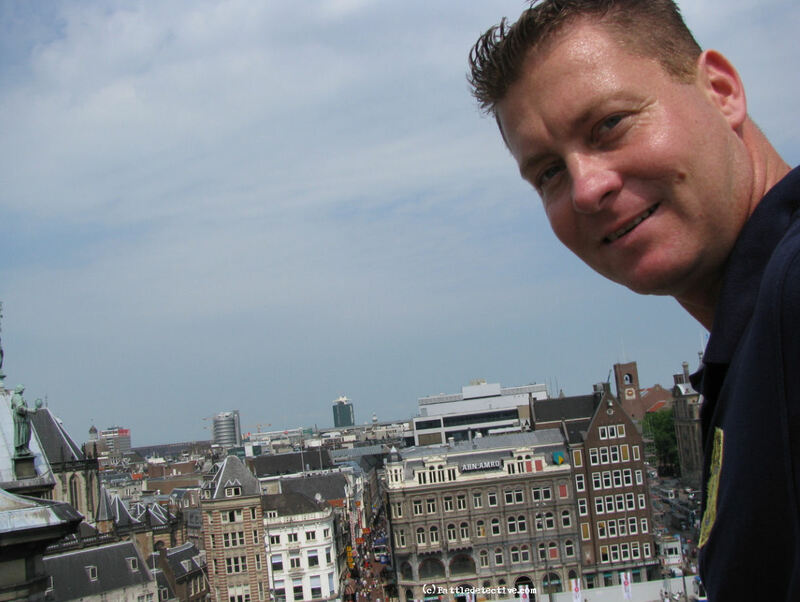 Access to balcony and rooftop of "de Groote Club"
The buildings on Dam, including the Groote Club, have not changed much over the years. 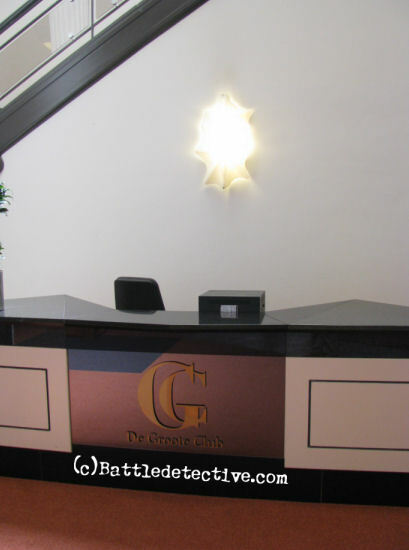 The Groote Club today, however, is divided in a section on the first, second and third floor around the balcony, housing a branch office of Rabobank and a larger section, with offices of various, mostly financial, businesses. 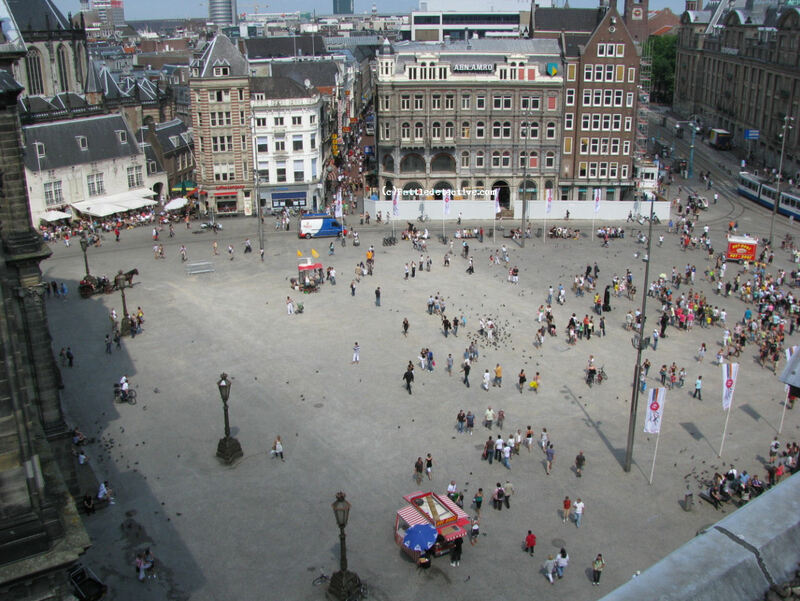 The corner of Paleis and Spui cannot be seen from here. 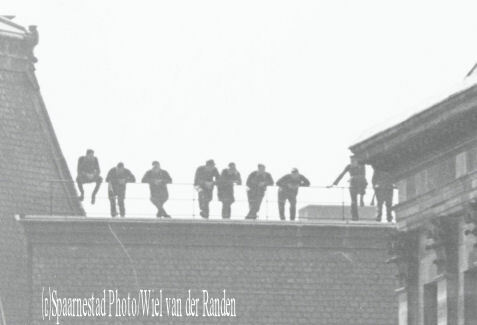 The men on the roof weren't able to see the scene on the corner, either. 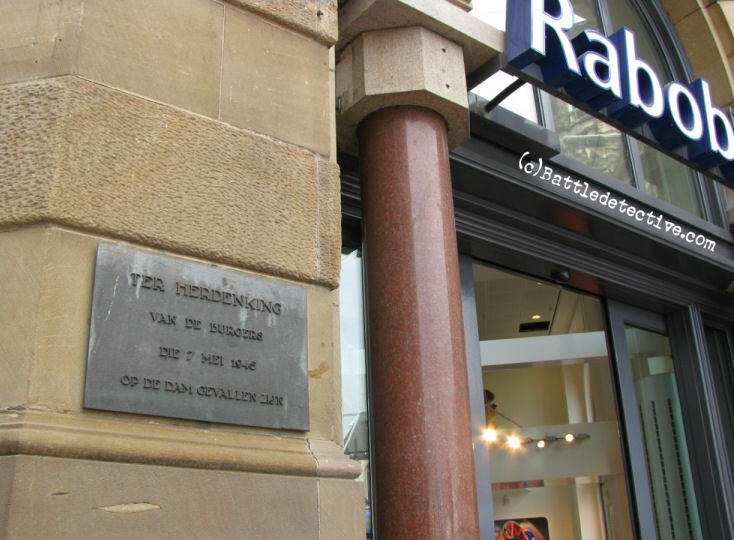 These pictures clearly show why most victims ("slachtoffers" in Dutch, indicated with an "Γ" symbol in the sketch, pictured above) fell at the corner of Dam Square and Damrak. troops ordered the Germans out of the Groote Club and they ware loaded onto trucks to be transported to a Prisoner of War facility. None of them were questioned, let alone charged, as a suspect of the senseless killing of civilians in a peace situation. Some accounts say that the use of alcoholic beverages by the Germans was instrumental to their actions. Frustration over loosing the war may also have been a factor. 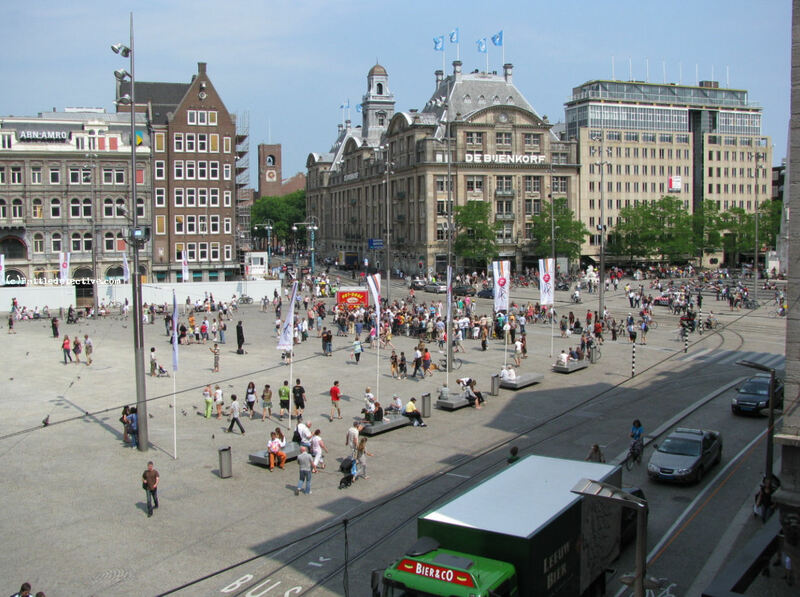 We have not found photographic evidence that substantiates the story of the "Women Tribunal on the truck on Dam Square". 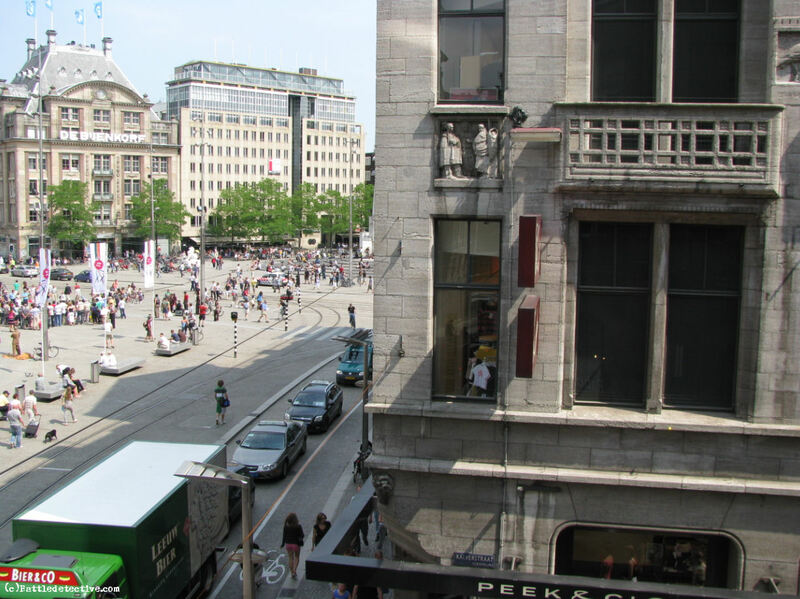 We do believe that through our examination of the views from the rooftop and balcony "crime scenes" we have established that the arrest at the corner of Spui and Paleis Straat was not, what caused the anger of the Germans. 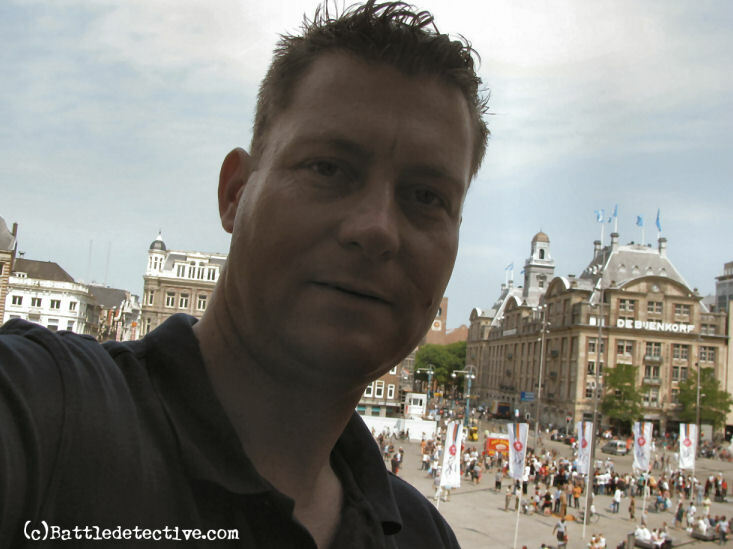 As stated in the Synopsis, there were many photographers and movie cameramen on Dam on the 7th of May, 1945. Photographs 1, 2 & 3 taken from Bijenkorf department store by Margreet van Konijnenburg. 1 People taking cover. Note bicycles Now & Then. 2 Victim is being transported in a cargo tricycle. 3 The same tricycle moving in direction of Dam. Note the window ledge Now & Then. 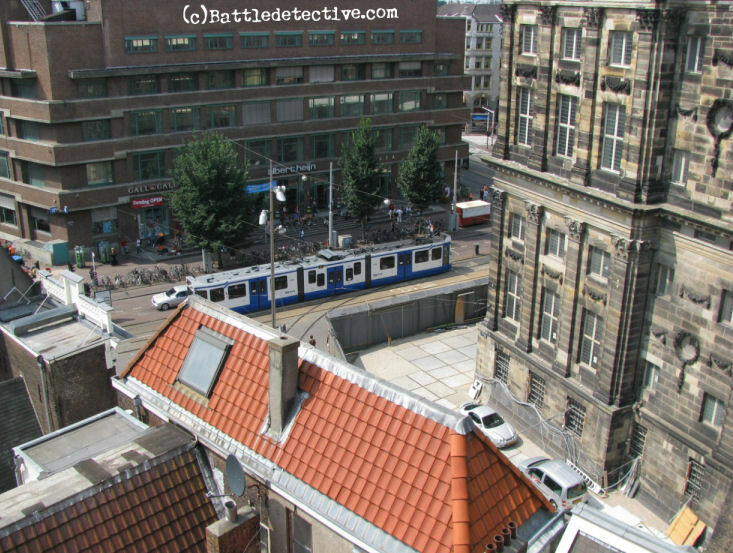 4 View from Eggert Straat towards Groote Club during or shortly after the shooting. Photo by J. W. Hofman. 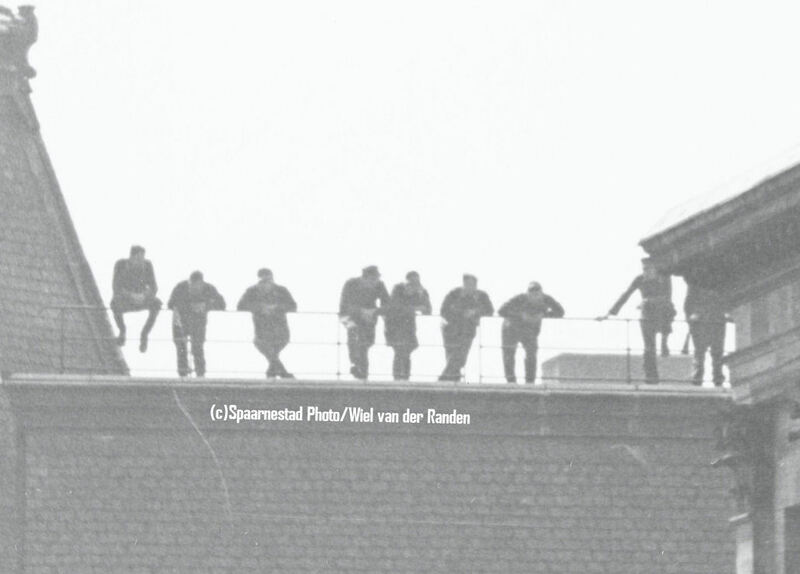 5 Armed members of the BS-resistance look towards the Groote Club under the roof of Beurs Poortje. 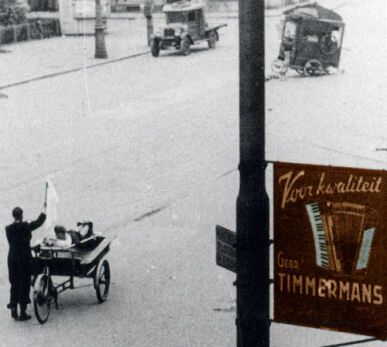 6 A man peaks around the corner of Rokin and Dam as another victim is wheeled away on a hand-cart.